X-Small - $73.99 Only 4 left! X-Large - $73.99 Only 3 left! The bell goes off. You slide down the pole, throw on your gear, and jump on the back of the truck. The station dog jumps up beside you and you're off, ready for action! Being a firefighter is something of a romanticized profession. The firemen get all the glory after running out of a burning house and saving the family cat. Though the reality is bit more stark, it’s fun to fantasize about being a big, tough, muscular fireman who’s ready for any challenge that comes his way. Afraid? Never. A firefighter is never afraid of the obstacles that lie ahead. He’s ready for the fire at all times and is always ready to run to his sweetheart after a long day on-call. 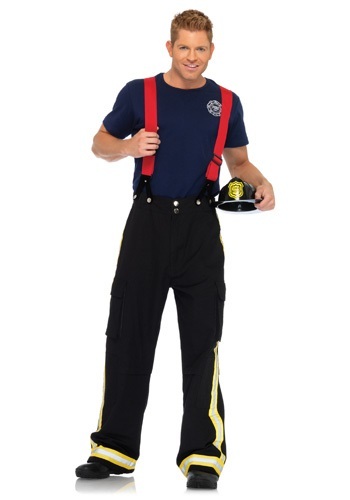 Become that smoldering firefighter you (or your partner) has always dreamed of with this hunky firefighter costume. This adult fireman costume comes with everything you need to put out fires while on the job and to start fires in the hearts of all of the firefighter groupies that come your way! Included in this costume is a shirt that has an embroidered Fire Dept. patch to be your base layer. The fireman’s pants are black with yellow safety stripes and feature a button and zip fly closure, elastic at the waist for a comfortable fit, and metal button detailing. The pants also have large cargo pockets on each of the legs. Top it off with the included red adjustable suspenders that secure to the waist via the button holes. Add a fireman’s hat and a pair of black boots to give this costume some additional authentic details.